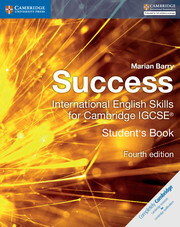 Our Success International English Skills Teacher's Book supports teachers throughout the Cambridge IGCSE® English as a Second Language (0510 / 0511 / 0991) syllabuses. The resource provides lesson-planning suggestions and model answers that allow teachers to focus on developing students’ skills. In addition, differentiation tips in the book help teachers support all learners, while the two CDs provide audio for the listening exercises in the student’s book. In this resource, we have provided the answers to the questions in both the student’s book and workbook. Useful tips and techniques provide guidance for differentiation in the classroom. For ease, the teacher’s book includes all answer keys and scripts from the student's book and the workbook, as well as model answers for each writing text type. 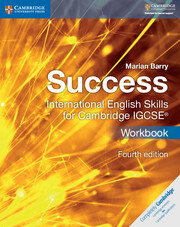 'Exam at a Glance' section provides a clear overview of the Cambridge International Examinations IGCSE® English as a Second Language assessment. 'Wider Practice' sections at the end of each unit present creative ideas to extend the learning themes of each unit. Includes CDs with all class audio. 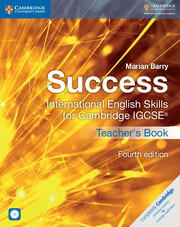 Offers practical support to teachers of Cambridge International Examinations IGCSE® English as a Second Language course.